After seeing reasonably large sucker holes, I had fetched the computer for the Paramount and set it up. We had been viewing various objects, and Saturn, in the C14. I ran about the property, and through the house, letting people know there was likely aurora happening. With some trepidation, I knocked at the T@B. Roused sleepy Skeena and Phil. Lora did not kill me. 20 seconds. We could see a green glow on the view screen! I was so happy. Here, at the Carr observatory, of course, was the place to be. Clouds still filled the air but not enough to block the view. I had a decent camera at my disposal. Steadied on a tripod. Now I just needed to better control the camera. And focus! All shot with a Canon 40D and 18-55 lens. I didn't know it at the time but I had put (in the dark) the camera into C1 mode versus M. So a bunch of weird settings were used, like a custom white balance of 4600. JPG was used instead of RAW. Also, initially, it was in high-speed continuous shooting drive mode. I never saw this... until after. Wasn't checkin' email I guess. Canon 40D, handheld, 18-55 lens, 1/200, f/5.6, ISO 400. Shot in tungsten (oops!) but corrected RAW CR2. The storm was gone. And on cue, rainbows appeared. I made a wish. Double rainbow. Secondary bow to the right of the bright one. I pointed out the reverse spectra to people. With the dark region between. We looked it up on the RASC Observer's Handbook: Alexander's Dark Band. Hey! Pot of gold is in the living room! Oh to have a wide-angle lens. All shot with a Canon 40D, 18-55 lens, ISO 400, auto exposure and speed, auto white balance. Did a bunch of errands downtown. Heard back from Nick: he had found a ride to the CAO. Asked Risa if she needed a lift to the open house. She was game. That let her offer her wheels to her brother. Packed up the car with some tools, camping gear, FRS radios, and hit the DVP. We picked up groceries. I needed stuff for my special "potato" salad. Sunny and warm in Richmond Hill. We took to Hwy 7 and it was a slow go as people started to bail out of the GTA. Shortly after taking the 400, it jammed up. I lobbied that we jump off and wing it. Took Weston road for a bit. Reminisced in Schomberg. Near Barrie, I realised we could take the Minesing "bypass." Risa navigated, helping me get through town. At Hwy 26, we stopped at the corner store-gas station-beer store-liquor store for a break and supplies. I found Antigravity! Ha! The skies darkened the further west we went. Not looking good. The skies opened in Rob Roy and along Grey Rd 2 with water leaking in the roof. At last we arrived the observatory. Unpacked. Risa offered a Coffee Porter—it went down very nicely. The Chows arrived a short time later with passengers Skeena and Sharmin. In short order, Sharmin had made us dinner. Delicious. Started thinking about preparing my potato salad for the potluck tomorrow. Waited for Tony to arrive, so to review the job jar list, before printing. Then the clouds started to break. OK. It was decided! Steve, Risa, and I headed out to set up the tents on the north lawn. Denis, the designated supervisor, wouldn't arrive until 9:00 PM. Offered to take Stu's red light to the CAO. He said that worked for him. Finally! As I was writing my response to Denis, it occurred to me, that we have a new "issue" in the GBO. Tim L caught it... Presently, with the laptop, we only have a single, ready computer to drive the Paramount. When David P arranged for the new laptop, many moons ago, that's when the mistake was made. We should have bought two computers; not one. Katrina had sent out a note about the temporary storage location for the Paramount/TheSky computer as a result of my lock maintenance. Denis suggested that since computers are "cheap as chips" nowadays, he suggested we consider leaving the GBO control computer in the observatory. Ralph chimed in. Said he was a bit worried about humidity and temperature factors, particularly if the computer was not running (and generating heat) all the time. Reminding all that the desktop computers deteriorated very quickly. Finally, I jumped in. Pointed out that it was not the cost of the computer that I'd be worried about. Tested the GoToStar again. This after picking up some 1-inch long 1/4-20 bolts and "spacers." I really wanted a solid metal sleeve but I couldn't find anything suitable. Actually, when I spotted the rubber grommets, I wondered if they might be better. The motor could float a bit, like on a suspension. I also found some well caps that could work. Couldn't get the Dec motor cover to fit, even after trimming. Turned out that it was too tight when the gears were run outboard vs. inboard. First results were not encouraging. Slewing suddenly stopped and hand controller showed a "high current" message. Took the cover off. The gears hopped at high speed. Cleaned up. Straightened Dec shaft with a large persuader (screwdriver). Motor ran wild! Light? Still wonky. Had I damaged the thin timing gear? Fortunately, it settled down when I bent the emitter back in a bit. Cover on. Everything protected. At last! Let Katrina, Scott, and Tony know that I picked up a new CO sensor for the CAO. Powered by mains with battery backup. Noted that the weather prediction for the weekend took a turn for the worse. The POP rose to 70%. Asked John if I could take a Dobsonian up to the CAO for the OHAP. Unfortunately (no, check that), they are all booked! Charles was off the grid. So, on his behalf, I issued the OHAP reminder on the RASC Toronto Centre group. Heard from Nicole and Gilles. They had to pause for the CAO Orion Room ceiling work for a family matter. Starting to redesign the CAO passport card. Asked Steve to provide some astro images. In particular, I want ones captured at the observatory! Apropos, no? Pointed out, to Manuel, that the Nautilus battery was going on sale again. Risa and I chatted about sundials at the CAO. Told her that I had wanted to make one for some time. Then she suggested an analemma! Cool. One would tell the date; the other would tell the time. Received Ralph's photos from the spring work party. Tried to immediately upload them to the RASC Toronto Centre Yahoo!Group but they were too large, 10 and 11 MB in some cases. Was it because they were 24-bit files? I quickly installed IrfanView and did a batch convert/rename. Manuel called. Asked if I was going to the meeting tonight with David Levy. Nope. That's next week. Realised he had the date wrong. He was hoping to get there so to "sneak" a picture of Levy. Then he asked if I was going to the CAO this weekend. I better be. He did know it was the open house. Said he "might" be able to go, with some negotiating, late on Friday. Asked if I wanted a ride. I thanked him anyway. I was going up early. Made a master list of all the prizes for the OHAP. Partly because there were so many items, in different people's hands, and that we might have too many, if the turn-out was small. It was a pleasure working with you, Blake. Perfect weather, and the evening astronomy was luxurious as well. To be able to have an automated system at hand, to share it easily, to pick targets and get involved was a treat. And at the end, to walk 50' and tuck into a nice B & B was also luxurious! Only flying at York Soaring beats that! And that's after workin' him pretty hard at the spring work party! Allard sent out a note regarding web matters, subdomains, and directories. I need to change the path for the weather station server upload. Conducted a Skype meeting with OHAP committee. Making sure our ducks were lined up. Sent a tentative schedule for the OHAP to the RASC Toronto Centre listserv. Shawn spotted there were no talks. I pointed out that made more time for socialising and stargazing! Chris asked if he could use my Cocoon sketch in his Skylab presentations. At the David Dunlap Observatory. Sure. In fact, I told him he could use anything. Spotted a post on the RASC TC Facebook page about the OHAP. A members only event. Asked the CAO committee to comment. I started working on the CAO welcome sign design. Or redesign. With the intention of getting vinyl lettering for the permanent content. Shared, on the RASC TC Yahoo!Group, that the while at astroCATs, I spotted the New Eyes Old Skies booth. And then I spotted the flyer! Grand opening, in Richmond Hill, on June 1. Woo hoo! 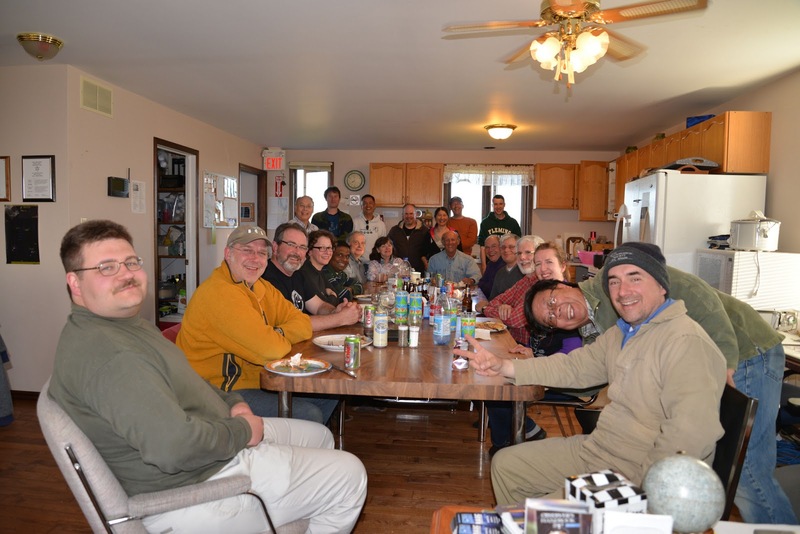 Sent a quick (but heart-felt) thank you to all the volunteers from the CAO spring work party. Phil had volunteered to write up the spring work party report. I offered to post on the web. Lora said he was writing a "book." He also grabbed the reins on photos. Sounds like he had material from Katrina, Lora, Fred, and Ralph. Excellent. Asked Charles if he'd remind the membership of the upcoming OHAP. And to link to the web site. Bailed from the SNO LAB tour. Asked a local astronomy shop if they needed a beta product tester. Manuel and I touched base. He sent a photo of Saturn. He was curious how the weekend at the CAO had been. He also said that his CGEM hand controller was "stuck" at the CAO, that he couldn't change the coordinates. I thought that odd. Said it was normally very easy to change. Gord messaged me directly wondering if there was room on the SNO LAB tour. I referred him to Peter. I was really proud of the work we accomplished over the work party weekend. A great crew. Very energetic. Hard working. Motivated. Made me and Tony look good. Photos from the work party are being loaded into the (private) RASC Toronto Centre Yahoo!Groups. Tested my remote access to the CAO security and weather server computer. It worked! Sent instructions to Dietmar, Tony, and Phil. Ostap and I cut out from the CAO early. We wanted to catch a tail end of the AstroCATS show. Saw Skynews, Khan, the RASC booth, Kendrick, the BYEOS booth, MallinCam, Starry Night, Astro Gizmos, iOptron, Vixen, Skywatcher, Camtech, Celestron, KW Telescopes, Telescope Performance Improvements, Starizona, and the DRAA booth. It was real good to see New Eyes Old Skies. It was pretty impressive. Smaller, to be sure, than NEAF. But very good representation! Everyone seemed happy. Vendors, manufacturers, attendees. Talk with the Kendrick crew for a while. Chatted with Lonnie at Celestron. He seemed to be enjoying his Toronto visit. Met Brady at KW. Chatted a bit. Thanked him again for supported our telescope clinic. Hung out at the SkyShed booth for quite a while. Ostap and Wayne chatted for a long time. I spotted our original three PODs at the CAO in his banner. Saw a few RASC peeps: Ron, Denis, Patrick, Colin, Paul M, Paul G. I suspect there were quite a few more. Hung around for the prize draws. They had some great items! As Ostap and I, after doing various errands at the cottage, pulled up to the intersection of 89 and 10/24, I slowly recognised the little silver car ahead: Risa! We meep-meeped and waved. Funny timing. I did not keep good observing notes over the weekend. I recall we spent some time observing Friday night and Saturday. Katrina flew the big 'scope. The seeing was marginal. But the transparency was surprisingly good on one of the evenings which afforded some decent views deep sky objects. I recall suggesting some red stars. So we viewed the Garnet Star, aka μ (mu) Cephei. And La Superba, aka Y Canum Venaticorum. Of course, we took in Saturn. I fired up the netbook and SkyTools 3 Pro and looked for candidates. For the stars, gave Katrina the reference with the SAO number, which helped in TheSky 6. I tried to make amends for my transgressions in the morning meeting. I thanked everyone for all their hard work. Pointed out that it was a very ambitious list! I printed up the list and then discussed to the assembled what we wanted to do. Redeployed the local server computer. So to monitor the CAO security camera system. Slightly. I had already installed some remote control software. I just had to doctor its default port numbers. To slide into the ones we were already using. I was confident it would work, after local testing. A full "exterior" test was required. But I didn't feel like screwin' with dial-up. And I didn't feel like badgering anyone back on Toronto. In the end, this is to get around the stupid (old) Internet Explorer ActiveX Q-See issues. This should offer a robust, platform independent solution. I helped Risa, briefly, with her polar scope. I didn't explain it well, but I tried to assure her it didn't matter that the lens changed position. Many of us viewed the conjunction. Right-angled triangle of planets. Fantastic. Many people shot photos. Photo by Ralph Chou. Nikon D600. sRGB. 85mm focal length. f/5.6. 1/15th. ISO 640. I kept hearing that this conjunction was "rare" but I wasn't sure why. It must have been in reference to the planets themselves. Mercury and Venus snuggle on a regular basis. It must be that Jupiter is not often in the mix. We were fortunate to have some decent skies. For some, it was the first time seeing Mercury with the Mark-I eyeball. Got outta work early. Phoned Dietmar at 3:20. He was happy to hear the news. We confirmed meeting location. I could be there in 30 minutes. When I emerged from the underground, he was waiting. Added my current luggage to the items I had dropped off the night before. Closed the hatch. And closed the hatch. We were on our way. Bloor West. Dundas West. 427. 401. 410. 10. 24. 89. Slow at the start but it proved an uneventful trip. Dietmar wanted to stop at Pete's in Shelburne. Gave me a chance to do a little errand. Success! A special item for Fred. Dietmar received his dinner sandwich. And we continued north. Made the CAO in good time. Just over 2¼ hours. A few people were already there. Risa. The Chows. The Princess (Skeena). At 6:00 PM, I realised that if I didn't set up my tent sooner I wouldn't want to do it later. Was waiting for Tony. So we could finalise plans for tomorrow. The first work party of 2013. Heard from a few places that a Chinese company, Jinghua Optics & Electronics Co., Ltd. or JOC, purchased Meade Instruments Corp. So, another American company changes hands. Peter sent out a note to the SNO LAB tour group. Reminded them that today was the last day of held rooms at the hotel. And that he needed to know people's plans with respect to food. He also forwarded my notes about cameras. Helped Risa, when she was going to visit the Barrie MEC, with directions to the CAO. Minesing by-pass! We also briefly discussed her polar scope. The reticule spun freely on her. And then we briefly chatted about future art-related projects. I received a Clear Sky Alarm Clock message. It showed good weather on Friday and Saturday. Good stuff. It'd be nice to have another work party in pleasant conditions. Helped James (at National) with the future Algonquin Adventure matters. He's working on the new Observer's Handbook. Allard confirmed the URL. We looped in Lillian and Bob. Asked Ostap about his travel plans and interest in astroCATS. He was game! Phil and I chatted about the impending changes to the RASC membership. The Canada Revenue Agency changes for non-profits will require some reconsideration for how associate members are treated. The Associate membership class will be eliminated. It will be replaced with a Family membership. Each family member will receive a unique RASC ID. The obvious impact is we'll need to track the new, unique ID for each family member associated with the primary. We discussed that if the primary member does not renew, then the family members will evaporate. Phil said this would "almost [certainly happen] after the Thunder Bay GA." I.e. end of June. So that would give us some time to talk. Asked Dietmar if he wanted to go to astroCATS on Sunday. He was interested but had already made arrangements with Ralph to do more work on the CAO video. 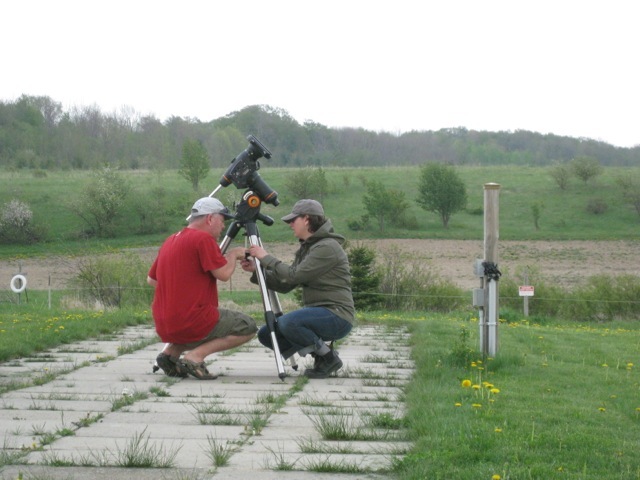 As published in the Jun/Jul 2013 issue of SCOPE, the newsletter of the RASC Toronto Centre. Republished here with permission. There's been a lot of talk about comets this season. Many of you were fortunate to see (and photograph) comet C/2012 L4 Pan-STARRS [ed: correction, C/2011...] in the late winter. If you missed that deep solar system visitor earlier this year, the good news is that you can have another go at it! It remains in northern skies. In fact, as it moves from Cepheus, through Draco, and into Ursa Minor, you can catch it late-night or early in the morning, before dawn. Similarly, comet C/2012 F6 Lemmon is available to us, near Andromeda. Both are around magnitude 6 or 7 at the time of writing, so well within the grasp of your binoculars or small telescope. The "big one" though, the comet that everyone seems to be talking about, is ISON. Due in the fall, some are predicting it to be extremely bright. Did you know that at any given moment there are a dozen or more comets "around" in our night skies? By around,I mean that can be viewed or imaged in medium to large telescopes. Try with your big Dob at the cottage. Or use the Celestron 14" at the CAO. I regularly use two web sites to monitor comets. I learned of one through Eric Briggs's The Sky This Month presentations. Seiichi Yoshida's http://aerith.net includes listings of visual and photographic comets. In the "Weekly Information about Bright Comets" page, the author gives a quick synopsis of each harbinger with a link. The associated detailed page includes orbital data (which you could load into your favourite software, if it doesn't do it automatically), finder charts, brightness chart, and an amateur photograph. The second resource I use is produced by the same person who developed the amazing SkyTools planning software. I confess: my SkyTools 3 Pro is usually not far away and I tend to check comet info there, make my own charts, and simulate views in eyepieces. But when my computer is not handy, I jump into http://cometchasing.skyhound.com to review our tantalising solar system bodies. The Skyhound site shows a listing of comets with a visibility table or month calendar for each. The overall order of the list is important: the brightest comets are at the top; faintest at the bottom. Greg Crinklaw specifically notes equipment needed: Mark I Eye ball, binoculars, small, or large telescope. Again, he offers finder charts. Hopefully you'll be able to add a couple more comets to your life list this summer. Happy hunting! Followed up with Manuel to determine if he chatted with Jason about the licence plate covers. Manuel was concerned about the dimensions and layout. Let Justin know about the BUD (big ugly dish), steel mesh, I saw on the trip home from the CAO, on Hwy 10, just south of 89. A potential candidate for our radio astronomy project? Asked Tony if there was an outstanding issue with any of security system sensors. Sent a note to Charles. Said that cameras were allowed into the SNO LAB. But discouraged people from taking in the camera bag, for they are harder (if not impossible) to clean. Asked Risa if she wanted more info, more detail, on the various things we had touched upon during the weekend. And cautioned that some topics, like dew fighting, are big. Sent follow-ups to the interested MODL people. Included a correction regarding the rates. I had quoted the wrong rate, for 2 years back. Told them we'd honour my quoted rate. But they both said it was inconsequential. Helped out Doug C. He had a free weekend and was interested in helping at the upcoming CAO work party! Awesome. Assured him there would be sleeping space in the house. Encouraged him to book. And reminded him of the logon credentials. The evenings sucked. Too much cloud. The transparency sucked. The swallows were distracted. The bugs sucked. I took on a lot of black fly bites (which I'll no doubt pay for later). As usual, I didn't get everything done that I wanted. I did successfully test my custom built Celestron data cable on the NexStar 11. I did successfully charge all the AA batteries for the solar lights. Delivered the "emergency" sheet sets. And hockey sticks. Retrained my ivy plants. Didn't test the old car reflectors. Didn't hike the property boundary. Still, I had a very enjoyable weekend. I thanked Katrina, Millie, Dietmar, Lora, Phil, and Risa. Reminded the CAO supervisors to familiarise themselves with the manual roof operation procedure, given all the trouble lately with the motor. Risa and I departed the CAO at the same time. She was curious my preferred route back to the city. I lead the way via Shelburne to Orangeville. Beautiful day for a drive. We stopped for a coffee at Tim's. And then I showed her the Highway 9 turn. She wanted to pick up the super highway. Ciao! Found it. We had a jar of red (ish) nail polish in the work room. For marking tools, etc. I put a dab on a couple of my EOS adapters and rings so to speed coupling and decoupling. 10:21 PM, Saturday, May 19, 2013. We saw a Moon bow. A halo. Almost a full circle. Katrina pointed it out to me. We tried photographing it. 10:25 PM. We viewed Saturn. 11:48. Willy and Ostap arrived. I knew it was Willy, my advanced driving buddy, when he turned in the foot of the driveway and then cut his zenon headlights. Not many people can do that now. 12:54 AM, Sunday, May 20, 2013. Heard the coyotes in the distance. 12:56 AM. Coyotes again. We also tried to capture them on audio. I showed Will some celestial treats including the Ring Nebula, Mizar and Alcor, epsilon Lyrae, the Great Hercules Cluster. 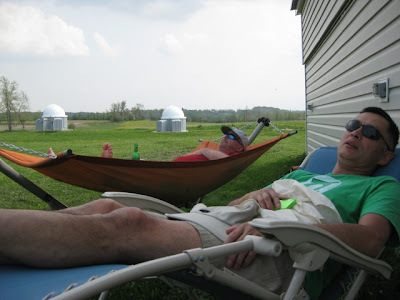 We visited C/2011 L4 Pan-STARRS. Briefly. Very dim. The Paramount found it, based on a recent entry; I confirmed the location with SkyTools. 1:08. We parked the beast. The high clouds were just not letting up. 1:20. Done. In the house. Set up the TV to to review photos. I wanted to shoot some photos of people observing. But I ended up not doing much. All with the Canon 40D, daylight white balance. As the Sun set, I captured Katrina at the east edge of the house. Vivitar Series 1 70-210 zoom at f/2.8, manually forcused, ISO 800, -1/3 exp. comp., 1/15th. Stabilised. I liked the silhouette effect of Risa's telescope. But I wanted people. Well, more people. Alex's gear is just visible at the far right. Millie's new mount and 'scope on the left. Canon 18-55 zoom at f/5.6 at 55, auto-focused, ISO 800, -1/3 exp. comp., 1/30th. Shot Phil at his binoculars. I liked this best. Canon 18-55 zoom at f/5.6 at 38, auto-focused, ISO 800, -1/3 exp. comp., 1/30th. But somehow, I'm not sure why, I was not satisfied. Or I was frustrated. I wasn't getting the results that I hoped for. Couldn't get the composition that I wanted. I know part of it was technical. I was happy that I was able to use my old lenses. I had played with the Series 1 zoom through the day, thanks to the M42 adapter. But something that was puzzling me was know how the ring was currently programmed. When I saw decent exposures, I assumed it was programmed for the correct lens. But still, there was something... discomfort? All processed in RAW with Canon DPP. I want to photo peepers. Alex D and his wife Christina visited the CAO just as we were wrapping up dinner. Dietmar and Phil gave them the grand tour. Then they started to set up on the east end of the Observing Pad. Helped Risa with her Celestron, mount, and tripod. Cleaned the Tony Horvatin Observatory. Including the lectern. We had some visitors over the winter... And I booted out the wasps. Dietmar set up his POD camera and tested it. Forwarded a test message. Worked good. Phil was happy but didn't have his camera. Katrina set up the observatory and the Coronado filters on the Tele Vue. The roof worked. Yeh! We did some solar observing. Some nice proms and filaments. While the women headed to the spa, I did a meridian flip and I connected the DSLR to the Solar Max rig. But hazy clouds prevented a clear shot. Did a bit of white light observing with the C14. Katrina thought the ocular very dirty. Agreed. I hauled the Oberwerk binoculars out. Katrina helped me put on the custom solar filter. It was a nice view, when the clouds afforded it. Swapped the old capacitor for another one, slightly "bigger." Dietmar and Phil helped. Had to release the motor mounts to get access to the plastic cover. De-energized the cap with a large screwdriver. Desoldered the wires from the new capacitor. Noted the blade connectors for the new cap were smaller; but the female connectors still bit. And the roof drive started working again. Did we fix it? Invited my good friend Will to visit me at the observatory. He was at a big family event in Collingwood. Knox visited the CAO. I gave him the full tour. I think he was pretty impressed. Discussed the Geoff Brown Observatory roof drive problems with Katrina. And what we were thinking of trying. When it failed! Teaching moment... I coached her on how to operate the manual crank. As I was cutting the front lawn, I spotted some small and large pieces of shingles. Those big winds. Asked Phil to shoot some photos of the house roof. And we sent a message to Tony. Determined, with Phil, the serial number of our Sky Quality Meter. 1221. Eric explained how to retrieve it. 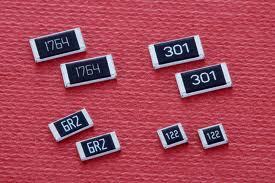 The serial number can be accessed by holding the button down. It should cycle through ambient temperature in Celsius and Fahrenheit first. Doug dropped by the CAO. Showed and flew a couple of large kites. 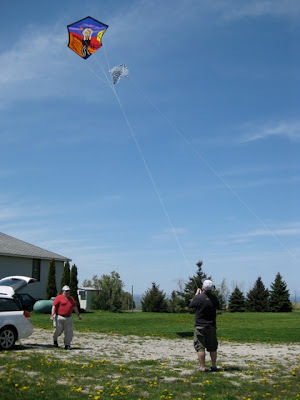 And showed some samples of small kites we could make as crafts. Everybody had a go (except snoozing Risa). Paid for the CAO annual pass. Another family membership. There! Happy now? Showed Risa my custom eyepiece case. She wants to better organise hers. I shared that the case itself came from Wal*Mart. Cheap at $20. And I bought the foam at a furniture wholesaler. Dietmar said he didn't like pluck foam. I explained how I cut the foam: for straight lines, a carpet knife, without the handle; an aluminum can, coiled, for the circles. Easy build, I think. Certainly inexpensive. Met Risa! As I was unloading gear to the house, she wandered into the kitchen from the hallway. Hello! Learned she had a good road trip from Regina. Welcome! Her first impressions of the CAO sounded really good. That was kinda wild. I picked up some movies from the library. It opened at 9:00 AM. I timed my TPL visit just after 9. Then it was in the car and to the highway. One pit stop, in Shelburne. I arrived the CAO at quarter after 11. I never went +15 over the limit; more like +10. It wasn't like there was no traffic. Wow. Delivered a carton of eggs. With a new fuel filter (thanks to Will) installed (I still stank of gas), the car running again, I could make the CAO! Yeh. I planned for a morning departure. Knox and I chatted on the phone about good routes to the CAO. He sounds like me. Comfortable exploring. Comfortable wingin' it. Phil offered a seat to the CAO. But it would require an early morning departure. And then I wouldn't be able to debug my wheels. Worse: I'd have to pack light. After consulting the CAO committee, Tony and I decided, finally, sadly, to postpone the locker project. Double star research. Read more stuff provided by Berko. The chapter he wrote for OMVDS (the Second Edition) is brilliant. Very helpful. Answered a number of unresolved questions for me. And now, I think, I know what I need to do! "We have the tools, and we have the talent" Finally! Dietmar, at the CAO, sounded glum. After reinstalling the cleaning CCD he found the desiccant exhausted. He could not image when it was perfectly clear and the oven baked the desiccant. He tried to switch gears. He fired up his brand new Canon DSLR to do some time-lapse and while changing the lens the focusing screen fell out. He gave up for the night. Then when he went to open the GBO roof for Millie it stuck. Got it going after some hand cranking. He decided to go to bed. Tempting. But, I pointed out, from home, my options are pretty limited, now that the trees are full of leaf. That said, I fired up Stellarium on John Charles and took a look. Huh. Ursa Major would fly directly overhead. A few Messiers in there. Some double stars. And the Moon was only 38% lit... Very tempting. Then I looked around me. The mount is not ready to go. The declination motor is on my desk. On the parts of my desk not covered with paperwork. The mountain. Still. And, as usual—the big challenge: the "one night effect." I am completely uninterested in setting up The Beast for one night. Pondered one of the little 'scopes. The Celestron 3-inch. 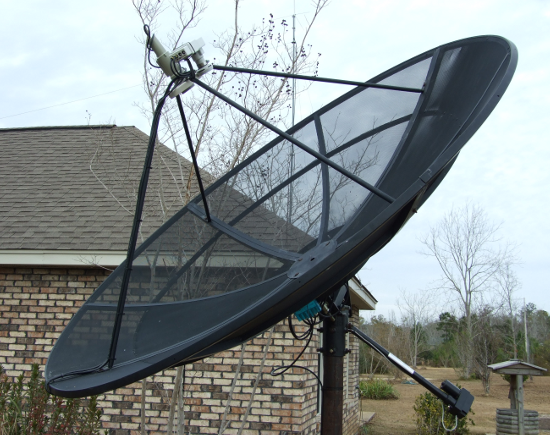 Or the Questar. Or the Meade ETX. Pondered photography. Trying to capture frames of a galaxy. I so wanna try that. Hmm. How about with a telescope? Tripod? Limits it to wide field. But then there's all the computing equipment. Ugh. Just not in the mood. watch for aurora up north! Phoned the CAO. Millie answered. We chit chatted for a bit. She had both her 'scopes (old and new) in the GBO. Good for her. I shared that I heard aurora notices. Encouraged to keep an eye out. Allard sent a note to Gilles. The webteam is getting ready to launch the new site for the Toronto Centre. Making sure files are backed up and the server options are set. Lora sent out a note to the supervisors clarifying the checks she does when members book for the CAO. Thanks! Car wouldn't start. Rescheduled a client meeting and took the TTC. Suddenly a weekend trip to the CAO seemed unlikely. Or more complicated. Doug would be visiting to do the "kite survey." Our two MODL customers were thinking about checking out the place. Risa would be landing after her long road trip. I wanted to tackle more loose ends. Or items ahead of the work party and open house. Phil could serve the people, of course. What to do? Finally chatted with Manuel. It was good to catch up, learn his feelings, what was on his mind. It was good to hear he had reflected. And perhaps I could help with a few matters. Woke up thinking about it. Shared my doubts about the rental locker project. That I was now concerned we no longer had enough seriously interested parties. My heart was heavy. Revised the design of the rental lockers for the CAO. Since Tony didn't want to change the height of the existing doors, I modified the initial plans to accommodate the taller door. I lost the elegant ratio of partitions to shelves. Which forced a seventh sheet of plywood. Sent the updated diagrams to Tony for review. Stu shared a link to his star trails "practice" shot. Wow. George Lake near Killarney. Dark, dark skies, similar to Manitoulin Island. Each image was 30 secs, ISO 400. He stuck them in Startrails.exe or StarStaX.exe (one gave a much smaller file size than the other). No bugs. Summer temperatures. SQM for 3 nights were 21.9, 21.8, 21.9. "I don't know what to make of those horizontal streaks." The stock 18-55 lens! I downloaded the image and set it as my wallpaper. Received the alarm company information in detail with Tony. Noted a few discrepancies between the two CAO profiles. Asked Tom if I could defer work on the RASC TC inventory project. A little swamped. Watched the hatch closing. Expedition 35 is heading home. Case done, at last. ε (epsilon) case version 2.0. Stalled for a few reasons. I wanted to fabricate some tools to cut the differently sized round holes. Manuel posted his first panel of the Sun, from the weekend. His camera; the RASC Tele Vue and RASC Solar Max. He got the hook! A crazy hook-shaped prominence. Manuel and I had talked about getting together. But I hadn't heard from him. Frost in Collingwood. Up on the mountain? Might there be snow?! When it rains... We have two interested parties in the last MODL. All right! Just installed Stellarium 0.12.1 onto the new computer, John Charles. Hey, what's this thing at the top-right? Ah, the ocular panel. Curiously, no way to minimise it, like the "standard toolbars." Slightly better implementation than in the past. But it still does not offer a list of the 'scopes or eyepieces. It will be impractical to use if you have a dozen oculars. So. A little awkward. Got a hit on the final MODL. That was quick! I sent a message to the CAO pass holders. Shared that we have one My Own Dome Lot left and that we were going to advertise it to the membership at large but we wanted to give them first shot. Sent a quick follow-up to Martin regarding the Carr Astronomical Observatory. I learned tonight, from the membership chair, that Iverson joined the RASC Toronto Centre. w00t! He may be the first official sign-up as a result of the new owners telescope clinic. I thanked Manuel for additional promoting. I'm very happy. Asked Dietmar and Eric about the Fastar system with the NexStar 11 telescope. Just wondering what may be involved if a member wanted to try fast imaging with the big OTA. And if not expensive, maybe we could get one. 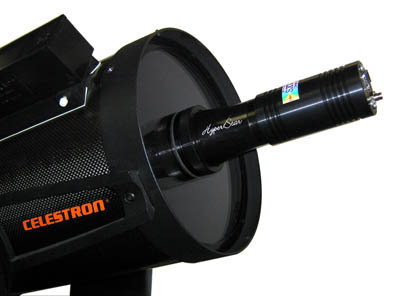 I was very surprised to learn that Celestron never made a Fastar lens for it! The only option was to get a HyperStar system from Starizona. Ouch. Not cheap... 900 clams. For the next SCOPE issue, I sent correction requests to Eric: Sharmin's surname, the IT email, the website and social media team email, the current CAO co-chairs, the reference to the "experimental" Facebook page. Asked Eric if we could insert a little piece in the next SCOPE newsletter regarding the repaired status of the NexStar 11 GPS telescope at the CAO. He liked it. Uploaded the recently revised (version 3.00) quick reference card / guide / sheets for the NexStar 11 GPS telescope at the CAO. Specifically, with notes on improving alignment and go-to performance. Sent a note to the CAO supervisors. I also shared that the data cable and computer control works well. Started watching the space walk at the International Space Station. They're trying to track down the leaking ammonia. Everybody looked like they were doing OK. Impressive, for an impromptu EVA. Reviewed the award citation from Ralph. Good to go. Tim H issued a "partial" call for the CAO. He thought the weather forecast poor for Friday but better for the day after. In the meantime, Katrina retracted. Manuel wanted Jason's telephone number. I didn't have it handy. Received the bed-in-a-bag sheet sets from Charles. I'll take these to the CAO. We heard, through the grapevine, about a member—in the NOVA class—interested in a MODL. 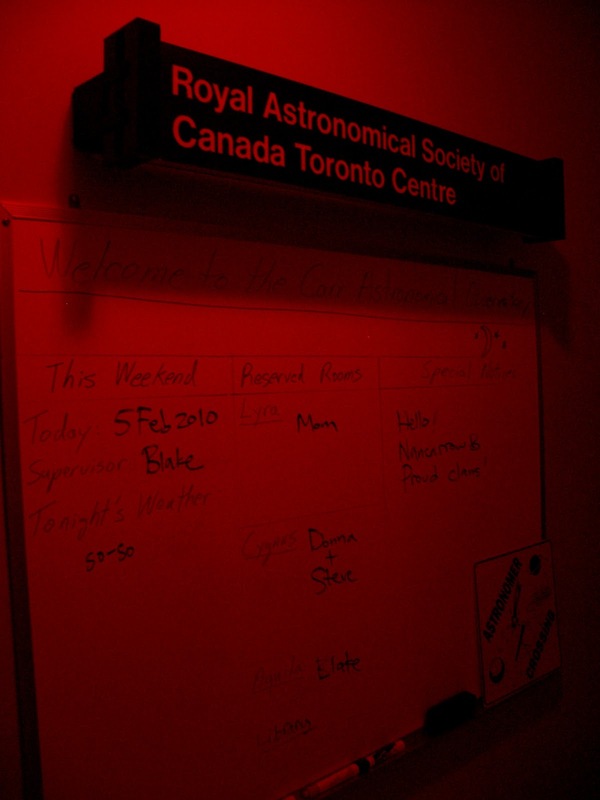 Delivered The Sky This Month presentation to the RASC Toronto Centre group at the Ontario Science Centre. Posted the content on the RASC web site. Provided the calendar PDF download, some images (many by our members), and two finder charts, for tracking down comets Pan-STARRS and Lemmon. Link killed. Look on the lumpy darkness companion site's presentations page. Delivered the SKYnyx camera to Bill. He wants to try a black and white CCD. Bill surprised me before the meeting. Sounded like he was able to duck out of work for a bit. Meant I did not need to hand off to Rajesh (or Diane). Asked Tony to deliver the SkyTools coupons to the NOVA course while I skedaddled to the auditorium to set up for my presentation... Thanks, man. Heard later, from Tanya, that the three winners were thrilled with their SkyTools prizes. Told Manuel that the 800 amp Nautilus Battery Pack was going on sale this weekend. We had talked about it briefly on the weekend. I looked up the info and relayed the notes to Tony. According to wikipedia, the time for a photon, released in fusion, to reach the surface of our Sun ranges anywhere from 50 million to 17000 years. In response to size of objects and field size discussion on the RASC TC Yahoo!Group, Paul M noted that TheSky and StarryNight offered field of view (FOV) indicators on the screen, helping one planning observing or imaging. He wasn't sure if Stellarium could. I shared that Stellarium could easily simulate FOVs a couple of ways. My preferred method was to use a virtual telescope, in turn making the software draw open circles over the sky background. I also pointed out the SkyTools could do this too, circles for eyepieces and rectangles for cameras. Katrina said she now had an empty seat for her next trip to the CAO. On the SNO LAB tour. Sent him the hotel rate from the Orillia excursion. And the rate Gord charged us for hospitality (times two), bagged lunch, and the bus. Proofed the article for the web site. And then ghost-wrote the Yahoo!Group notice. And reminded him to make a sign-up sheet for the meeting... And set up and tested the email forwarder. Sent him copy and a photo for the OHAP slide, for the announcements presentation. We learned that Manuel had slept on a bed and used a pillow with the proper covers over the weekend. He was rude and disrespectful to a fellow member when they raised the matter with him. I was very disappointed to learn this. It even made me wonder if he was revealing a sexist attitude. Regardless, it is unfortunate. He doesn't seem to realise that his actions at the CAO are disruptive and unfair. He's making other members uncomfortable. Maybe, as a manager, I can address these issues before his next trip. Having hand-delivered the card, I realised Manuel didn't have the cover letter provided with the CAO pass renewal. I made and emailed a PDF version. Manuel posted a very positive review of the CAO. I want to share the great time I had a CAO this weekend. I had the opportunity to share with great people and to learn. I also want to express my gratitude to Ian, our supervisor, for a very enjoyable weekend. [Of] course, skies were great! Friday night was a bit windy but it rendered amazing views of the night sky. I am glad I was able to target Saturn in a clear sky scenario. Also, imaging our own star was a great experience. Hope to share these images in the near future. Richard asked for the CAO SBIG filter info. I sent him my configuration notes. Followed up with Ian D and Tony re. the monies received over the weekend at the CAO. Reminded Ian to complete the income report and Tony to make the cash deposit at the bank. Offered the link to the forms. Scanned my sketch, from the weekend, of the Cocoon galaxy. I compared to a very nice photo of the curiously shaped galaxy. Photo by Frank Uroda. From the Black River Observatory galaxies page. Used with permission. Asked Stu if he would be at the Wednesday meeting. I could drop off the red LED light. Nope. He was heading north, into Killarney. Argh. Thanked Manuel for letting me borrow his Celestron data cable. Said that I appreciated him taking the extra steps to find it. It proved that the NexStar 11 GPS could be computer controlled. And told him that we'd be getting a cable for members to use. Manuel and I, as we traveled back to the city, had a mano a mano talk. I tried to correct one key point that he seemed to be unclear about. That if he changed his plans during a CAO visit, that he should, out of courtesy—principally for other members—let the organisers, and in particular the bookings person, know. He said that Tony had told him it didn't matter. I said that I thought Tony meant that he didn't want Manuel to worry about a mistake this time, but that in the future it would be in fact important. He had booked space for three people including himself and consequently it was noted that the CAO bed spaces were "full." When his two guests changed their plans and he did not inform us of the cancellation, it may have prevented members from booking, thinking they'd have to sleep outside. He "held" or "blocked" space. When we might have received more members for such a nice weekend. In the end, I felt stymied. I don't think I was able to convey my thoughts correctly. Manuel seemed very upset and unreceptive. And I realised suddenly that we were both equally stubborn. We did a few chores and tasks are the CAO this weekend. Trevor installed our best battery in the mower and started it. Probably the grounds will need cutting next weekend! I checked the fuel supply. We had lots. the door closed. We intend to replace this at the work party. I stuck a sticker. I tried to get some more supervisor photos... I find it curious that Ian does not pose well. Tested my new GBO code. Checked the supply of charcoal briquettes and lighter fluid. Manuel changed things up over the weekend. Originally he had invited two friends to join him at the CAO. In fact, they were going to travel up together. Hence, the need for a large vehicle. When they bailed, we switched back to the minivan. But then, on Saturday, Manuel invited a different friend up, Henry. Urged him to stay over night. Manuel guided him to the site on Saturday afternoon. Henry did some brief observing but spent much of the evening inside. Sunday, at noon, they headed out for a tennis match. In the meantime everyone else tidied up and then left the grounds. I was packed up and ready to go when Henry and Manuel returned. Update: Looking back now, it occurs to me why this incident was very upsetting. Manuel G's disappearance on Sunday showed a complete lack of respect for us at the CAO. He did not contribute to cleaning, tidying up, and the closing of the place he, and his guest, had used over the weekend. He was selfish, more concerned with himself and playing tennis, than he was helping us. At the time it soured my mood. Oh oh. Good thing we didn't try to offer them! Charles said he still had the new bed sheets at home. We need to get these to the CAO, stat! He didn't want to use our PayPal method so we accepted cash on the site. Ian wrote up the report and Tony took the money to deposit. And I handed Manuel his new CAO pass card. Mom and I donated a self-standing hammock to the CAO. This unit I had given Mom a few years back, for her to enjoy, under the trees in the backyard. But I don't think she ever used it. We agreed it would see more use at the observatory. 7:54 PM, Saturday 4 May 2013. The peepers had started. Spent some time at the computer, thinking about what I want to do for the evening. Heh, now that I didn't have to chase any Messiers! Reviewed NexStar materials along with my observations and things-to-do in Evernote. Built a new SkyTools 3 Pro observing list. With some old favourites. And a couple of new quarries. Chatted with Tony's guests after he showed the THO. Didn't look they were dressed properly. 8:52 PM. I wanted to test the Powermate and PTR with the Canon. It should give a similar experience as would my C8. I wanted to revisit Messier 83, early, and the best time to do that would be around midnight. Wanted to try things with the NexStar, shake it down, to improve alignment, and go-to performance. For example, trying the SAS program, for choosing better alignment stars, by some mathematical means (but I forgot the particulars). Do the compass and altitude calibrations (which I had not done last night). And to immediately change one of the alignment stars with a new star in the east. I thought that when I did that before it has worked well. And I wanted to sketch. That would be fun. Considered M86. The skies were supposed to be better tonight. I realised this was an ambitious plan for the evening. And if I was going to hook up the camera, for testing, maybe I could do some actual imaging! I wondered if I would get field rotation in the NexStar. I think you do, in any alt-az mount. I heard people talking outside. Tony's group? Leveled the tripod with a long spirit level. Redid the GPS alignment. Carefully set the date and time. Did the calibration steps. The frogs were incredibly loud. 9:13. Went to Jupiter. It was in the low power eyepiece. Good stuff. Had trouble connecting SkyTools until I realised the software thought the mount was parked. 9:20. Slewed to Meissa. OK again. In the field. Put on my music. Some good Boards of Canada. Manuel popped by and said hello. He was waiting for the guests to depart... Sounded a little irked. And now I was wondering about my advice, urging him to set up in the GBO. Hrrm. 9:48. Tried to view a planetary nebulae. The Ghost of Jupiter. I could not see it. Checked the software. Not dark enough. Tony dropped by. The guests from the Pretty River school, including Mara and Geordi, were just leaving. He said they were pretty excited (no pun intended) and wanted to arrange a future visit. They were suitably impressed. I asked if he had them sign the guest book. Oops. 10:08. Looked at Saturn. I could see a few moons. Dione to the south west. Rhea to the south. Something to the right, east, just off the ring, either Enceladus or Tethys. Well beyond was Titan. 10:14. Went from the 18mm to the 9mm, I thought I could see the two moons. Seeing went bad. Then worse. I made a note to return later. The night was young. The amazing planet was still below the 2 air mass. 10:37. Did the GLOBE at Night evaluation, using Leo. Chose the second darkest rating, 6, versus the darkest, 7. Noted a field for the SQM reading. Used our unit. Took readings from 21.11 to 21.15. The form requested the SQM serial number but I didn't know where to find that. Offered to send it later, upon request. I took a screen snapshot for my result. 10:40. Tony had left the parking lot lights on. I let him know but he was watching TV. So I shut them off while retrieving the Sky Quality Meter. Reviewed the process for replacing an alignment star. 10:48. Replaced an alignment star. That procedure wasn't in my Quick Reference Guide (although I was sure I had updated from version 1.0). Headed to Markarian 132 (aka PGC 29013) in Ursa Major. 11:01. I could not see the object. But then when I checked the chart in ST3P, I noted it was very small! And magnitude 14.5. I decided to mark it as unobserved. Headed to the next target. Alarm went off. The Psion reminding me to prep for M83. 11:16. Found it very strange how field of view is changing. I didn't know where west was. Slowly, I realised it was down, for the current orientation. Was sure I found Holmberg II (aka Arp 268), an 11.2 magnitude galaxy, very faint, very soft. ST3P said it was an irregular galaxy. I looked for other things in the 'hood. Perhaps the bright stars to the right or south? 11:18. A little triangle of stars, above, really faint. Verified it with TYC 04377 2664 1. I found the bright stars to the right, including HD 68435, mag 7 star. Seemed to be a sprinkling of stars around or in the galaxy. Very faint, structure. 11.2 mag. I thought it really hard to see. Weird. Another irregular galaxy. It was almost straight up! Crazy. Reviewed M83's height path in the SkyTools Night Bar. I should view it in about 30 to 45 minutes. I added the priority flag in the list. Cleared the previous status indicators. Decided to go for the Cigar. Manuel turned on his car lights. I asked him to turn them off. Sheesh. Tony visited again. He took a look in the 'scope. Thought there was a bit of green tinge. Quite bright. I centred it for him, using the controls on the computer. He enjoyed the view but had never heard M82 called the Cigar. I panned a bit, from the computer, to include M81. Tony liked the contrast. Reported to Tony that the 'scope was working well. Noticed I had some significant cable wrap. Unwound the cable from the tripod. Realised I had never programmed the cable option. Tony told me he had to move Manuel's mount having chosen a poor location on the floor. While doing so, they found the tripod was not secured, not tight! Of course, Manuel had to redo his alignment. He also reported that Richard had been imaging. But the software didn't save images. Doh! Tony suddenly developed the hiccups. Ha! Asked Tony if he wanted to look at anything. M51, the Whirlpool. Added it to my list. Slewed, hit it. Had to adjust the seat very low. Tony liked the contrast. Something fast went through—he thought it a meteor. I checked the orientation: east to west. He reported a lot of detail in the galaxies with averted vision. It was close to midnight. I slewed to M83. Monitored the cable. I let Tony turn the roof. He did it from the outside, thought it turned nicely. He said it was windy out, chilly. Nothing in the field. Checked the chart. I was off a little. We checked the vibration on the concrete pad and the wood floor. Tony thought it touching somewhere. I still did not see galaxy. Went to γ (gamma) Hydrae. Synced and reslewed. "Beauty," Tony said. I checked the altitude: 15°. Pretty low, pretty mucky. "How did Messier see this?!" Tony wondered. Indeed. Something zipped through the field for me while soaking up photons. Another meteor? Tony said they had seen a lot tonight. I reminded him we were near the peak. Oh! 12:15 AM, Sunday 5 May 2013. I suggested the Ring Nebula. Viewed in lower power. Tony did his Homer "donut" impersonation. Good one. I bumped the power, with the 20mm. Headed to the house for a coffee break. Reviewed the peak date for the η (eta) Aquarids. According to the Observer's Handbook, today at 1:00 AM. Uh huh. 12:55 AM. Returned from the break. While walking from the house, noticed the Altair and Tarazed in the east. Then Cygnus. Then I noticed the Milky Way horizontal or parallel to the ground. About 30 or 40 degrees above the horizon. Pretty cool. Called Tony out to take a look. He was surprised to see Scorpius rising. The stars in the east seemed brighter, clearer. The transparency must have been better. 1:04. Viewed the Blackeye. Had to pan up and left a bit. Could see some detail in it. Shells. Very faint stars to the north. Tried syncing and slewing a few times without success. Changed an alignment star. 1:30. Checked the remaining recording time: 1 hour. Unwrapped the cord from the tripod. Noticed that go-to's with the controller were OK, pretty well centred; the software didn't seem to match, despite the sync. The flashing X seemed to be getting worse. The software didn't know where the telescope was pointing. I wondered if I should break the connection. 1:42. When I disconnected and reconnected, it was bang-on! Hit it this time. Yes! Oh. Forgot that I had the Pentax in. Quite big. To the north east end, there was a bit of a hook. A strange appearance to it. 1:45. Seems to be brighter on the north east end vs the south west end. Dropped the lower eyepiece. That suggested I could pan to the west, and catch the galaxy, which was the Whale. I used the ASCOM hand controller tool on the computer and saw the X move in SkyTools. 1:51. Quite lovely. Viewed the Whale (NGC 4631, Caldwell 32) and its little companion, NGC 4627. Moved to the Cocoon and its small companion, NGC 4485. Ooh. Neat. A very interesting galaxy. Finally a subject I was interested in drawing. Got out the sketching gear. Three pencils, H, HB, B. My nice notepad. Deep red light with head strap. Used the camera's lens hood to draw a circle. 2:24. Finished the sketch of the Cocoon galaxy. Enjoyed that. Not feeling great at the beginning. Worked out OK. Tried to add as many stars as I could see. I hoped it would turn out well. Next. I wanted to conduct the camera test. 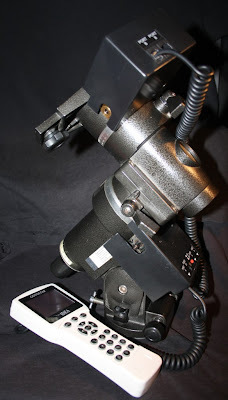 Ensure the Powermate and PTR would work correctly with the Canon EOS and an SCT. All the while, I wanted to keep it simple: so no computer connection or computer camera control. I'd adjust the camera directly. Slewed to π (pi) Boötis. Starting shooting some long exposures to focus... Was not seeing anything. Realised I needed an extension tube. Headed to the GBO. 2:52. Made a point of getting the star dead centre. At last I could see it. Activated the camera timer. Shot a bunch of frames adjusting the exposure. Started at 15 seconds. π Boo A and B are the bright bluish-white stars in the centre; the dim C star (yellowy-orange) is a little ways away, to the bottom left, or 8 o'clock position. North is bottom-right; east is top-right. 3:07. Confirmed everything worked. SCT, visual back, rotatable thing, extension tube, Powermate, PTR, Canon EOS t-ring, body. Getting a decent split. I didn't think I could proceed with actual data collection without know more about the process.. Consider just having some fun, still shooting, but at a wider field. Maybe to get some colour. I removed the 2x and refocused. 3:27. Finished shooting the darks. Put the visual equipment back in. 3:30. A good night. Fun objects. Enjoyed some music. Got quite a lot down. Disconnected the software. Did a quick shutdown for the THO. Capped the OTA. Removed the USB cable. 3:36. Checked the outside conditions: 973mb (uncorrected for elevation), 32% humidity, 13.0°C temperature. It had risen a bit. Turned the roof to home. Locked it. Closed the lower flap; then the upper. Disconnected the various power cords. 3:40. Indoor. Rain in 24 hours Pressure steady. Humidity 40%. Temp 13.1. Packed for return to the house: Manuel's data cable, the netbook, the recorder. Tomorrow... I'd pack up the rest. Sadly. 3:43. From the parking lot. Spotted Delphinus. Aquila up really high. Milky Way much better. Ophiuchus. Scorpius completely up. Good transparency down low. Could see almost all the stringer. Perseus was climbing. Hello Summer! Malcolm Park sent out a notice via Facebook. Starfest 2013. 99 days to go! He announced the schedule and speakers list was up. Updated the CAO internet usage stats for the year, so far. Lots of room. Manuel was imaging the Sun with the Tele Vue. Capturing lots of frames with his camera. We were chatting by the pergola when I heard the Paramount alarm go off. I raced to the observatory floor. Whew. Fortunately, nothing bad had happened. No collisions. No wild slews. Ian and I restarted everything. And all was fine. I messaged Dietmar. He said that alarms could be caused by balance issues. I wondered if the gear engagement controls were too tight again. Sent Stu a note. That I too had viewed the last few entries in my Messier log. After 23 years, I finally viewed all Messier objects! w00t! Last night I chased down the last few between Leo, Virgo, and Coma. Of course, along the way, I saw a few others! I logged 47 galaxies total! My final 12 Messiers; the rest NGCs! Didn't notice, at the time, that I had replied to a "funny" address. Found the serial data cable at the Paramount loose. Very strange. Tightened the two screws. what was the fee sked? It was great being back! 9:00 PM, Friday, May 3, 2013. Had the NexStar 11 GPS up and running. With my eyepiece equipment. In the Tony Horvatin Observatory. I had finished the alignment process. Telescope and mount seemed to be working fine. I had prepared a list of the "unseen" Messier objects, in SkyTools 3 Pro, a short list. Still did not have the ASCOM driver installed. I resigned myself to using the hand controller only. The sky looked good. No clouds anywhere. It was quite windy though, coming out of south east. Wind was 16 km/h. Stars overhead were twinkling. So, not great seeing. Checked the time remaining on the Sony voice recorder. About 4 hours. So not a lot. Put the recorder beside the computer, hoping I wouldn't bonk it or knock it over. 10:13 PM. Just went for object. M61. Turned the roof. Checked the whole sky, Spica, Saturn, in Virgo. 10:18. The spring peeper frogs were very loud. Got quiet for a moment. Then back up to full volume! The bulb in the south-east corner was very bright. And at a bad angle. I turned it out. I checked the view in the eyepiece. Nothing obvious. I panned around but did not see anything obvious. Went to a known star, Spica. It was near centre. Interesting. Off a bit, not a lot. Couldn't remember how to recalibrate, checked the quick notes. Nothing there; grabbed the full user guide. Reviewed the steps about approaching from the bottom left. Yes... but nothing about syncing or calibrating. Found the note about replacing alignment stars. Fine. I anticipated having to do some star hopping. 10:22. Peepers went quiet again. Is it a cycle? Or is something disturbing them? 10:25. Manuel visited me. Asked him to pocket his flashlight. He was imaging, collecting some data on Saturn. His tracking was good; he was happy with his CGEM. He thought the seeing was OK. Knew that Saturn would reach the meridian around midnight. He liked how it looked inside the THO, suggested I take a picture. He said it felt like a spaceship. Awesome view. He liked my comfy chair for visitors! He took a look through the eyepiece but I wasn't on a particular target. I started hopping, with the baader planetarium 36mm eyepiece (78x), using the charts in SkyTools, and found I was fairly close. In short order I found Messier 61. Centred. Could see some structure, some detail in the arms. Manuel liked the view. 10:33. Peepers went silent. So weird. "There's nothing more inspiring than a dark sky." Bumped the power with the Pentax 20mm (and adapter), so 140x. It was a nice view, more detail visible. Then, big power, with the Tele Vue 9mm (310x). Soaked in some photons. Manuel noted the centre of the galaxy. 10:40. Manuel returned to the Observing Pad. The peepers were in a lull. Then back up to full power! 10:44. Peepers were ramping up again. Checked the voice recorder. 4 hours left. Decided to turn on the VOR, to conserve space. It occurred to me that now that I regularly use the DIVIDE function of the recorder, I'd still be able to keep an accurate note of the time, even if the recorder paused. 10:45. Discovered I did not have the Pentax eyepiece in SkyTools (for the N11). M61 is a big object! Closed the telescope view; opened the Interactive Atlas with the Context Viewer. Turned off all the red lighting in the THO. Turned off the netbook screen as well. Wanted to better absorb the dim galaxy. Wild! 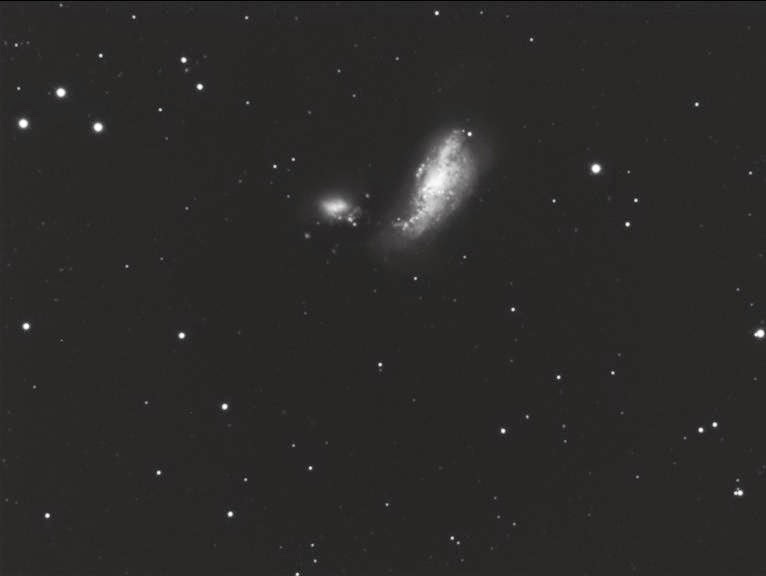 Spotted NGC 4301 beside M61, a small faint (magnitude 13.4) round smudge. A bit to the north-east of the large galaxy. Due east of a 13 mag star (GSC 00285-0805). Heard Tony talking with Manuel on the Observing Pad. 10:54. I was very happy seeing M61 in Virgo. Even though I had to do a little star hop. 10:56. Noted, naked eye, a fuzzy blob in Cancer. Ah, The Beehive. M44. Just to the left of Pollux. Readied to view M100. Activated the telescope view in ST3P. Tony visited me. But without treats. Left the lights up for a bit for him to get his bearings.. Said it was very windy. Agreed it was from the south east. And that Manuel was envious. Asked how the NexStar was working. The go-to performance was OK. No jumpiness. Good tracking. He was pleased that I had fixed it. He thought the view was funny. Kind of swimming. Like swirling currents or eddies in water, geometric patterns. It did get steady for him. I wondered if there might be some high clouds as well. Asked how the roof was working. I said it was still a bit heavy at times. He helped me trace the metallic flapping sound. The floor vent in the window. Tony tried to close it but it wouldn't move. Told him not to worry. Tony shared that Richard was having a bit of trouble with his guide 'scope. I shared with Tony that Richard had found the east sockets not powered in the GBO observatory floor. I debugged it when I found the GFCI socket tripped on the north wall. Clearly they were daisy-chained. Tony suggested we put stickers on the east wall sockets. Saved Richard having to move. We talked about chores to do tomorrow. 11:20. Tony left. Said he was heading for bed. Moved the computer from the lectern to the integrated table. 11:34. Ended up on a galaxy but I didn't know what it was. Finally, after panning north, I found Messier 100. I could see the nearby edge-on galaxy NGC 4312. A pair of stars mag 13 (but not a double) beside the thin galaxy. Manuel popped by. "I'm screwed." The wind was bad, shaking his 'scope. Felt like it was getting stronger. He wondered if he should move his 'scope; I suggested he could just cover it. But he forgot his bungee cords. Richard popped by too. Richard suggested Manuel could set up in GBO tomorrow. 11:36. Noted a very bright star (mag 6.5) to the west of the 4312: HD 107415. Confirmed. So, finally found M100. Confirmed. I knew for certain where I was. I headed south to try to identify the two galaxies I had seen earlier. South of M100 I had found two galaxies close together, both small, one edge-on, one canted, NGC 4302 and 4298. Widely separated stars lay to the north east, HD 107598 and a Tycho 00879-0048 1. These two small galaxies were about 1½ degrees away from M100. This is where the NexStar had dropped me when I requested Messier 100! 11:41. Added the two little galaxies to my ST3P list. The wind seemed stronger still. 11:47. Had a little look-see of St. Katherine's Wheel (aka Messier 99) since it was so close. It is just west of the two little galaxies. Viewed M99 before. Quite nice in the wide field. Bright stars nearby. To the west is HD 106888. North east, bright star, HD 107170. Double star HJ 207. Neat. Lots going on in that area. Decided to take a break. And get some jelly beans! 12:08 AM, Saturday, May 4, 2013. Did the trick again: after the go-to, I did a little pan north, for a bit, about a field or so. Found everything. Centred on a star in the middle of the triangle of galaxies. Ha! There's a very small fuzzy in the middle, NGC 4387. To the north east, Messier 86. To the west, from centre, Messier 84. See M86 and M84, they're obvious. There's a little needle-like galaxy, below them, south, NGC 4388. Another edge-on galaxy, due north of M86, NGC 4402. Wow. Five galaxies right there. Checked the time left on the recorder: over 3 hours. The floor vents were really oscillating. 12:14 AM. Considered this to be one of the best deep sky sessions in a very long time. Just spotted NGC 4413, a small oval. Just below stars TYC 00880-0904 1 and TYC 00880-777 1. And due south of M86. Spotted the another thin galaxy, NGC 4425, near the star HD 108450. South east of M86. 12:19. The wind had picked up. Getting gusty. Manuel was using a white light out on the Observing Pad. Looked like he was packing up. Checked the OneWorld portable weather station, which I had put outside the THO, on the other edge of the lower door flap. The barometer ready was 934mb (to which I would normally add 42). [ed: Realised later that the elevation was a factor.] Humidity was 21%. The temperature: 15.5°C. Toasty. Earlier I had taken off my jacket. Nose was running; eyes watering. I pulled the hoody around the side of my face to block the wind. Traveled east from M86. Arrived at NGC 4438 and 4435. These galaxies looked about the same size to me; SkyTools however shows that they are very different, 4438 being 3 or 4 times larger. They have bright centres. There is a nice gaggle stars to the east, including bright SAO 100120. There seemed to be a bright star over top a fuzzy in the north east. I identified NGC 4461. And then 4458. 12:23. Was winging it. Following the chain of galaxies, following to the north east. Was enjoying using the 36mm. The 56 arcminute field was quite pleasing. 12:25. Saw the large galaxies NGC 4473 and 4477. And, at a right angle to them, the smaller galaxy 4479. Wild. Just wild, all these galaxies. 12:41. I back-tracked along the chain of galaxies, back to M84 and M86, and then panned south east to Messier 87. I could see the little fuzzies beside it, NGC 4478 and further out 4476, to the west. There was a pair of non-related stars to the south east. And nearly due east, an eye-catching triangle of stars. With the double star HIP 61189 within. 12:48. I began the trip to Messier 49. 12:56. Once again, the go-to function did not tag M49. And when I tried going up, I ended up lost in space. But after some checks, I found my way. The interesting galaxy I was seeing, I identified in SkyTools. Curiously, ST3P called it "the Lost Galaxy." I was lost but now I was found. Also known as NGC 4535. It was really cool. I could see stars within it, er, ahead of it. Wild. Averted vision helped. I could see distinct stars! I saw the two bright stars to the north, HD 109360 and 109440. And to the west of these stars, and inline, another faint small fuzzy, NGC 4519. Then I went south. Found a big, bright galaxy! This canted fuzzy was NGC 4526. Exactly between two bright stars, HD 109285 and 109417. 1:08. Went the wrong direction. M49 was to the west; I ended up east. And south. But I stumbled across the very thin galaxy NGC 4570. 1:13. I made a point of panning left or west from the Lost Galaxy and 4526. At last, I arrived at Messier 49. M49 was bright and mottled. To the north east I could see the little fuzzy NGC 4492. And there was a super bright star within 4492. Spotted the small galaxy NGC 4470 to the south of M49. To the north east, saw the thin oval NGC 4488. Peepers went silent for a moment. 1:23. The wind seemed to be up, again. The 10-min average was now 29. And a high reading of 40 was registered. Richard visited me, while his rig is capturing M101. He thought the seeing was poor and highly variable. But tomorrow night was supposed to be even better. Richard said he had checked "sail flow" forecast and the wind was supposed to drop. We grumbled about firmware and software quality these days. I offered my Canon DC coupler but it wouldn't fit his camera. We heard coyotes. I reminded him that the Moon rises just before 3:00 AM. 1½ hours to go! Spotted a bright η (eta) Aquarid meteor, low in the west. Really good. 1:48. After a long-ish hop I found Messier 85. And the nearby companion NGC 4394. Wonderful. 2:00. Another funny go-to situation. Was trying to get to Messier 88. Off by about 2 degrees, to the south east. And came across Messier 90 to the north, quite nice, canted, glowing centre, quite large. And to the south M89, face-on, fairly dim. The galaxies were each at the edge of the field. Saw a right-angle triangle of stars near M90. There's a little gaggle of stars in the centre of the eyepiece. At first I thought it a stylised-S, or a zig-zag. Perhaps a Little Dipper, with a pan or handle? Panned to the west a bit to spot NGC 4531. This confirmed I was in the right area. 2:08. Went too far. I ended up at Messier 91, thinking I was on NGC 4571. Oops! I returned to the bright collection of stars to the north east of M90. These stars contain the multi-star system HJ 2616. Used the bright star SAO 100177 as a marker for the small galaxy. 4517 [ed: oops, 4571] is mottled. 2:14. Quite lovely. Messier 88 is very nice. Jumped up to the 20mm for a bit. Fantastic. Interesting detail. But the 36mm wide was very nice too, with field stars all around. I could see the very tiny NGC 4516 to the north east. Holy cow. OK. To the last one... Messier 83, just off the border of Centaurus. And I was about 2 hours too late... I wondered what I'd see. 2:26. Viewed 83. So low. Barely detectable, the large round galaxy. I considered leaving it unobserved. I should try again... Tomorrow night. I'd set an alarm so to view it at the best time. So, while the view of Messier 83 was not the best, it was perhaps the 2nd or 3rd time that I had tried for it. And saw something. Technically, that meant I had viewed every object in Charles Messier's famous catalogue. Wow. What a feeling. Amazing: 110 objects. I immediately flew back, in my mind, to seeing the Pleiades and the Andromeda Galaxy in the Muskokas in the late 80s. That probably represents when I first became aware of the Messier catalogue and that people used it as a check list. 46 galaxies! What a fun night. 2:27. Downloaded the Celestron Unified ASCOM driver. Installed it. Configured SkyTools 3 Pro to use it. Still had the cable attached, via the USB adapter. Connected successfully. Tried panning. Added Saturn to the observing list. Then performed a slew. It worked fine! 2:38. Noted quite a lot of settings in the driver, including controls to pan or nudge. Found a sync command. 2:41. Started zoning out. Took that as a sign... Adrenaline wearing off. Started packing up. Oregon Scientific—inside conditions. Pressure dropping. Rain in 24 hours. Humidity 39%. Temp 15.7°C. OneWorld—outside conditions. 933mb, 26%, 15.4°. Considered sketching tonight but just couldn't get energised to do it. And the later it went, the less inclined I was. I didn't realise it at the time but in viewing the arc of galaxies from M84 through NGC 4477, I had viewed the Markarian's Chain. The amazing Wikipedia says "member galaxies include M84 (NGC 4374), M86 (NGC 4406), NGC 4477, NGC 4473, NGC 4461, NGC 4458, NGC 4438 and NGC 4435." Wow.